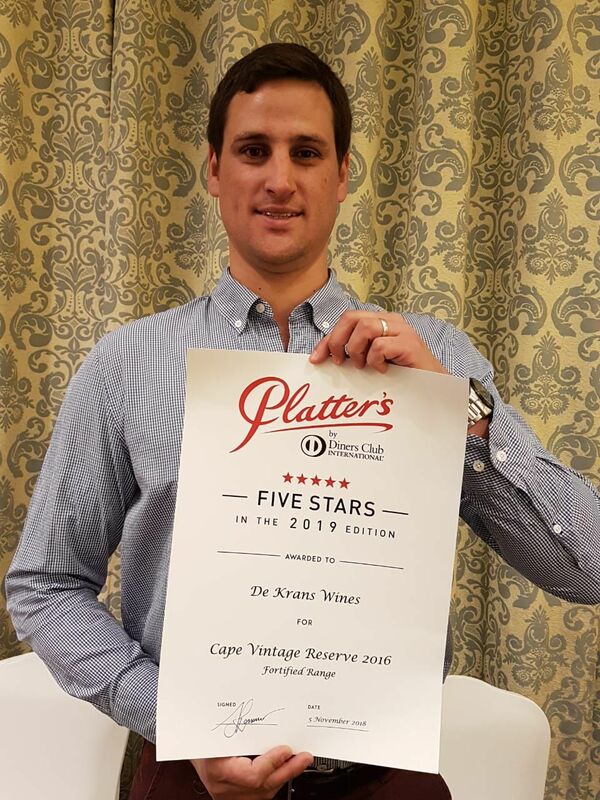 De Krans Wine Cellar, situated in Calitzdorp along the Route 62, has received a five-star rating for its Cape Vintage Reserve 2016 in the latest edition of the authoritative and internationally recognized Platter’s by Diners Club South African Wine Guide 2019, due for release this month. The results were announced on Monday, 5 November at an event held in Cape Town, which was attended by members of the wine and media industries. A total of 90 five star wines were awarded the coveted five star status this year. Earlier this year the same port was awarded Platinum at the 2018 Michelangelo International Wine Awards. In addition, the Cape Vintage Reserve 2016 was named Overall Fortified Wine of the Year in the annual review of South African wines by leading authority on wine Tim Atkin MW. Atkin also scored the port-style wine an impressive rating of 96 points. According to winemaker Louis van der Riet the Cape Vintage Reserve is a big wine full of ripe dark fruit notes of plum, mulberry and black currents. The wine is well-rounded by smooth cacao and smoky undertones. It has firm tannins that will ensure an excellent maturation potential for many decades to come. The perfect port to enjoy with most baked desserts, in a sauce over ice-cream, well matured cheeses, or simply on its own. This wine will only be released in the Autumn of 2019.